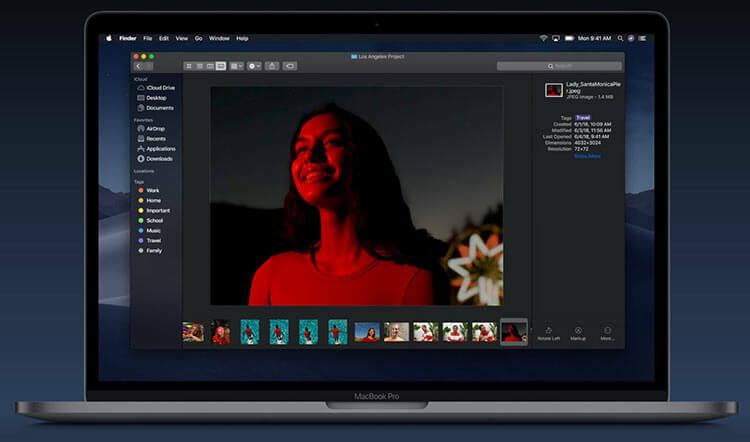 Experience a dramatic new look for your Mac that puts your content front and center while controls recede into the background. Enjoy new app designs that are easier on your eyes in dark environments. View an ever-changing desktop picture with Dynamic Desktop. Automatically organize your desktop files by kind, date, or tag using Stacks. Capture stills and video of your screen using the new Screenshot utility. Find your files visually using large previews in Gallery View. See full metadata for all file types in the Preview pane. 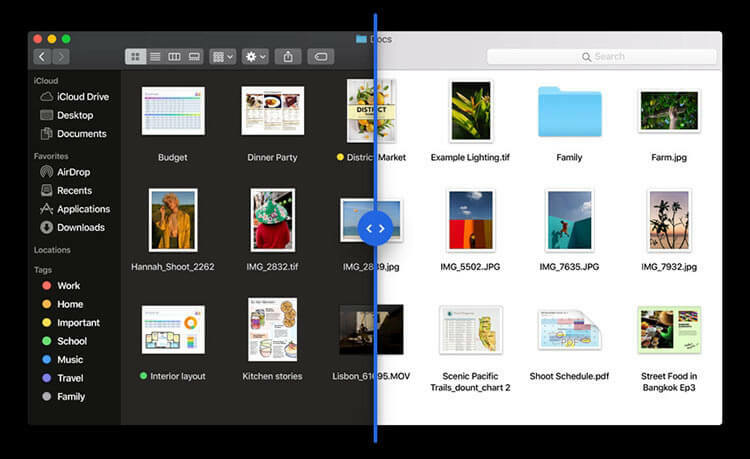 Rotate an image, create a PDF, and more — right in the Finder using Quick Actions. Mark up and sign PDFs, crop images, and trim audio and video files using Quick Look. Photograph an object or scan a document nearby using your iPhone, and it automatically appears on your Mac. Browse handpicked apps in the new Discover, Create, Work, and Play tabs. Discover the perfect app and make the most of those you have with stories, curated collections, and videos. Search with lyrics to find a song using a few of the words you remember. Start a personalized station of any artist’s music from the enhanced artist pages. Enjoy the new Friends Mix, a playlist of songs your friends are listening to. Block Share and Like buttons, comment widgets, and embedded content from tracking you without your permission with enhanced Intelligent Tracking Prevention. Prevent websites from tracking your Mac using a simplified system profile that makes you more anonymous online. Read Top Stories selected by Apple News editors, trending stories popular with readers, and a customized feed created just for you. Keep your favorite topics, channels, and saved stories up to date on your Mac and iOS devices. Create a customized watchlist and view interactive charts that sync across your Mac and iOS devices. Browse business news driving the markets curated by Apple News editors. Make audio recordings, listen to them as you work with other apps, or use them in a podcast, song, or video. Access audio clips from your iPhone on your Mac using iCloud. Organize and control all of your HomeKit accessories from your desktop. Receive real-time notifications from your home devices while you work. 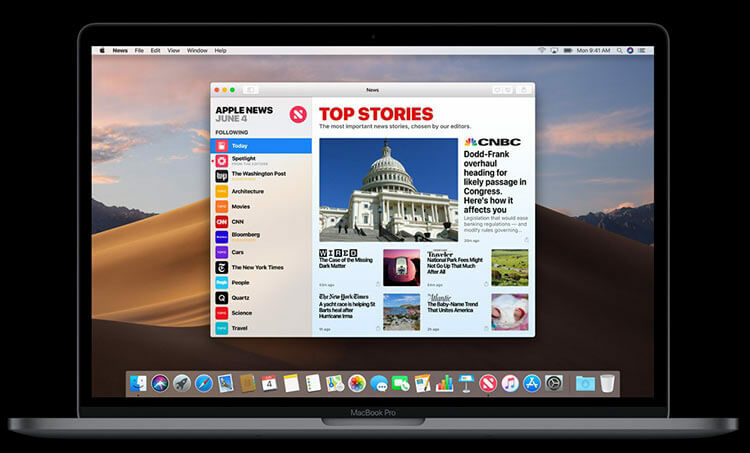 The macOS Mojave 10.14.4 update adds support for Apple News+, includes bug fixes and improvements, improves the stability and reliability of your Mac.